It is axiomatic in the art world that most painters are ignored during their lives and forgotten after their deaths. William Sanger (1873-1961) fared better than many artists during his life because of his innate talent and after his death because of the notoriety of his wife, Margaret. While living, Sanger had several solo exhibitions in the 1920s and 1930s at such galleries as the Touchstone Gallery, the Brown-Robertson Studio and the Delphic Studio, all in New York City, along with exhibiting in numerous group shows in the city and around the country. His last solo show was in 1931. Now, 55 years after his death, and 85 years after his last solo exhibition, William Sanger is the subject of a solo exhibition at the Tides Institute and Museum of Art in Eastport, Maine, a town that Sanger visited in the 1920s and the site of some of his most vibrant watercolors, including South End Bridge, now in the Brooklyn Museum and Unitarian Church, Eastport, Maine, exhibited at the Art Institute of Chicago in 1927, its location now unknown. Several artists trekked to Eastport in the 1920s to paint. It is as far east as one can get in this country. When I was there last weekend dropping off a dozen paintings for the show, my IPhone automatically switched to Canada time. The steep rocky cliffs and swirling surf of the Maine coast downeast were the subject of most of Sanger's paintings. Sanger also ventured into New Brunswick, Canada to Grand Manan Island, where he painted the Gannet Rock Lighthouse several times, as well as the island's harbor. Art historian Alexandra Anderson has contributed a critical essay for the exhibition catalogue, where she cites the influences of Albert Pinkham Ryder, Thomas Hart Benton, Marsden Hartley and John Marin on Sanger's paintings. Sanger's palette consists of aquamarine, deep blue, grey, sharp white and russet earth tones. More than one critic commented that he was a master of leaving white spaces in his scenes. 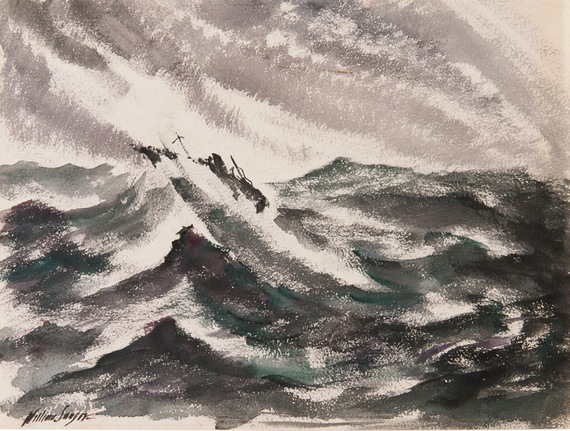 Sanger's seas are stormy, the skies are dark and threatening and the rocks unforgiving. There is, as Anderson says, a frenetic feeling and pulsating energy. There is turmoil, foreboding, a sinister feeling. The influence of El Greco is palpable. Sanger had gone to Spain in 1917 in the middle of the Great War (a not undangerous voyage) to see El Greco's works first hand. Sanger was a) German-born, b) too old for U.S. military service and c) would have refused to serve as a conscientious objector if drafted. Sanger visited the 1913 Armory Show multiple times and decided to leave his architecture practice in New York and go to Paris to paint. He spent a year there, returning only when the outbreak of war, and his wife's arrest in New York for her birth control work, compelled him to return. It is the incident following Margaret Sanger's arrest for publishing The Woman Rebel that William Sanger is best known for. Margaret went into exile rather than face trial. Anthony Comstock, the government's obscenity enforcer (birth control was obscene under the law) entrapped William into handing one of his wife's pamphlets to an undercover police officer. Comstock offered to drop the charges if he would reveal his wife's whereabouts. He gallantly refused, even though they were estranged and headed for divorce, went on trial and was sentenced to 30 days in prison after a trial as tumultuous as one of his later paintings of the Maine coast. The trial made headlines, and William Sanger became a hero to all who opposed government censorship of medical information and who supported a woman's right to choose when and whether to have children. William Sanger was a radical and revolutionary at heart, a romantic, a fighter for his beliefs and a political philosopher (he was working on an illustrated biography of Thomas Paine at his death). He fought against injustice and poverty his whole life. He was an angry, agitated man. He endured the worst tragedy a parent can when his and Margaret's 5-year-old daughter Peggy died of pneumonia shortly after he was released from prison. He never forgave himself. More than once he painted ships crashing onto rocks. The seas are menacing, reflecting, as his granddaughter Nora Hoppe says, his portentous view of the world. The sense of impending doom and tragedy envelope the viewer, as I think they enveloped William Sanger. So why was William Sanger forgotten by the art world? Watercolors are undervalued in the art world. Even masters like John Marin are now largely ignored. Marin and Sanger's styles were overtaken by Abstract Expressionism. But Sanger's works are too powerful and visceral to be ignored. As Alexandra Anderson says, he is an undiscovered American Modernist and overdue for rediscovery.